It's brutally cold out right now -- snow on the ground, wind chills in the negative numbers. One of the boys joked that they were REALLY glad they weren't at Valley Forge this week, and I realized I hadn't shared about our field trip from there (when it was much warmer)! This was actually our second visit to Valley Forge National Military Park; we had been there a few years ago when we had family visiting us. This time, we went to earn Junior Ranger badges. We actually earned two -- one for the park itself, and a second special Paleontology badge -- Valley Forge is one of several parks designated as a "fossil park." We began at the museum in the visitor's center. There are several exhibits in the museum about life as a soldier during the encampment. I love how the Junior Ranger program cuts across so many types of study -- there's usually a page that involves critical thinking, some math, a bit of history and science. One of the tasks were to search the center's database to find out about a soldier who is featured in the museum. Other tasks were to find things that were needed during the encampment. We learned that supplies were very limited. Between limited funding and the British takeover of Philadelphia, there wasn't a whole lot to be found. Washington chose Valley Forge because of its location - not far from the city, but deep enough into the country to be able to find local provisions. We then went back to working on our historical books. One of the pages sent us out to the reproduction Muhlenberg cabins. It's hard to believe how quickly the huts were constructed -- enough for everyone within just a few weeks! Although, not freezing to death was probably great motivation. One of these tasks were to count how many logs were needed for each building, and then multiply how many trees were felled to build the camp. Three students came up with three different numbers. Did we count only long logs? Maybe they used the ends to make the shorter pieces. Do chimneys count? In the end, we found out the Ranger's secret -- there isn't a firm answer, so they're mostly checking to make sure you visited them. It's not about knowing exactly how many logs, but understanding how they were constructed, and the sheer volume of trees needed to shelter the soldiers. Across from the cabins was a canon, marking where the Army's position would have been guarded. Of course, the little boys had to pretend to be soldiers. We then headed back on the driving tour. There are several stopping points. One is this memorial arch. We eventually found our way to Washington's Headquarters. A small, interactive museum can be found in a former train station -- in the early 1900s, the Reading Railroad established a station stop on the park grounds. In the valley next to the depot is where the Isaac Potts house is located; General Washington and his entourage rented the house for the winter. There was a young man who served as Washington's Aide-de-Camp, who worked in that very room behind Matthew. Can you guess who it was? We were running out of time, so we headed back to the visitor center to turn in our books. I was disappointed we didn't have time for Washington's Chapel -- when we had visited here before, it was pouring rain. I wanted to see the stained glass windows in the sunlight. Sounds like a reason for another trip back! 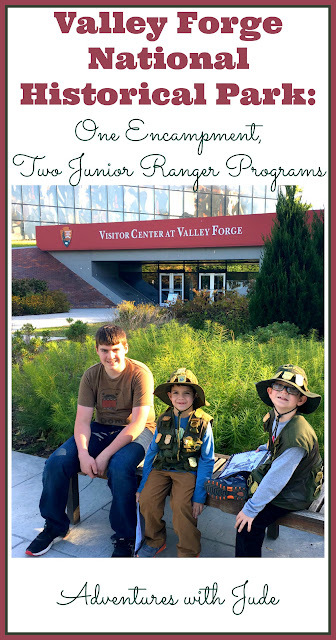 The boys' books were checked and the little boys were sworn in as both Valley Forge Junior Rangers and National Park Service Junior Paleontologists.